PHOENIX – When Beth Alford-Sullivan took over at the University of Tennessee, Christian Coleman told her that he wanted to put the Volunteers back on the map. It’s safe to say he did just that in 2017 as he won four NCAA titles, broke or tied a pair of collegiate records and now added winning The Bowerman to his resume. 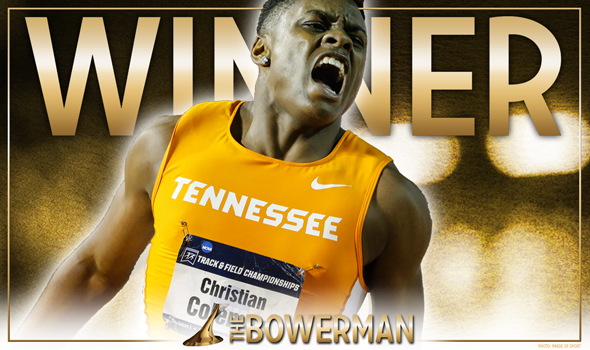 Coleman became the first Tennessee athlete to win collegiate track & field’s highest honor on Friday night as he was feted during The Bowerman Presentation at the JW Marriott Phoenix Desert Ridge Resort & Spa during the 2017 USTFCCCA Convention. He also is the fourth male athlete from the Southeastern Conference to win The Bowerman in a row, joining Deon Lendore (2014), Marquis Dendy (2015) and Jarrion Lawson (2016). The former Tennessee standout beat out the strongest group of men’s finalists in the history of The Bowerman. This year was the first time in the nine years that The Bowerman has been around that all three finalists shattered collegiate records. Fred Kerley lowered the all-time mark in the 400 and was part of several record-breaking relay teams, while Lindon Victor twice bettered the collegiate decathlon record, not to mention Coleman’s aforementioned feats. Coleman separated himself from the pack at the 2017 NCAA Division I Outdoor Track & Field Championships when he completed the double-double. He was the first male athlete in NCAA DI history to sweep the indoor and outdoor short-sprint titles since fellow Volunteer great Justin Gatlin in 2002. It was back in College Station, Texas at the indoor meet in March where Coleman started his assault on the record book. Coleman won the 60 and 200 as he tied the collegiate record in the 60 with his time of 6.45, then clocked the second fastest time in collegiate history in the 200 (20.11). Coleman continued his track-blistering ways in Eugene, Oregon three months later at Historic Hayward Field. He destroyed 2011 The Bowerman winner Ngoni Makusha’s collegiate record of 9.89 in the 100 in the semifinals (Coleman ran 9.82) en route to an easy win in the final. Then he completed the sweep with a time of 20.25 over 200 meters into a stiff 3.1-meter-per-second headwind. And while it doesn’t factor into the result of The Bowerman (Only times and marks achieved during the collegiate track & field cycle – from December to June – count), Coleman starred at the 2017 IAAF World Championships in London. Coleman won silver in the 100 as he beat world record holder Usain Bolt and finished runner-up to who else, but Gatlin.